Is Anti-Malware Pro a legitimate program? The name of Anti-Malware Pro clearly states what is the aim of this program. This anti-spyware software is definitely the right tool if you are looking for a computer protection software. It is an attractive and easy-to-use security program that wards off malware attacks and also cleans the system from existing viruses and spyware. It must be noted that these two features are extremely beneficial and deliver comprehensive protection because many anti-spyware or anti-malware programs simply remove existing threats but doesn’t provide real-time protection. 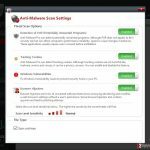 In other words, Anti-Malware Pro 2017 creates a shield that prevents zero-day attacks and does not allow trojans, bots, worms, adware, browser hijackers and more to enter your computer system, and at the same time offers a powerful scanner that thoroughly investigates the entire system and wipes out malware and spyware that managed to slither into the system in the past. The scanner of this anti-spyware program handles malware threats, privacy threats, browser hijackers, cleans browsers from shady tracking cookies and also detects Windows vulnerabilities. We would like to discuss the last feature – in our opinion, it is very useful for people who do not keep up with the latest Windows Updates. It detects what Windows Security Updates you are missing and suggests installing them. However, we want to highlight a few drawbacks that immediately caught our eye once we began scanning the computer with this program. First of all, despite the fact that Anti-Malware Pro advertises itself as a security program that doesn’t slow the computer down, sadly, its scanner actually makes the computer run slowly. However, since this program allows you to plan system scans in advance, you can avoid the issue by scheduling system scans at times when you are not around. Another drawback is that the program needs quite a lot of time to scan the entire computer system. It is easy to manage this anti-spyware tool – its interface is user-friendly and requires very little maintenance. Its default settings are configured to provide powerful protection, so you can just install it and let it be. However, if you want to satisfy your personal needs, you can easily configure settings and modify scan level intensity, choose which system areas to scan and which ones to skip, and also, if you need to check a particular folder or file, just command this anti-spyware to scan it via Custom Scan feature. Finally, if you have questions about Anti-Malware Pro, you can check the knowledge base for frequently asked questions and find answers to them, but you can also get in touch with support and get live help from Anti-Malware Pro technicians that are available 24/7. On top of that, Anti-Malware Pro has an interesting feature – it provides a live-stream of the latest detected malware examples across the globe and shows their severity rate. You can download Anti-Malware Pro here. Please bear in mind that it is compatible with Windows XP/Vista/7/8/8.1 and 10 versions only. The installer weights 4.25 MB, and it doesn’t take a long time to install the program. Once installed, the software immediately starts scanning the system and provides detailed scan results. Please pay attention to the fact that the free version of Anti-Malware Pro 2017 only allows you to scan the system, but not delete detected threats. To access this feature, you need to purchase Anti-Malware Pro Subscription Plan, which costs $39,97 excluding VAT (1 PC Licence). Please take note that the software license is valid for six months, and once this period passes, the subscription will be auto-renewed. You can opt-out auto-renewal if you wish, and what is more, you can request a refund within 30 days from the purchase of the license key. 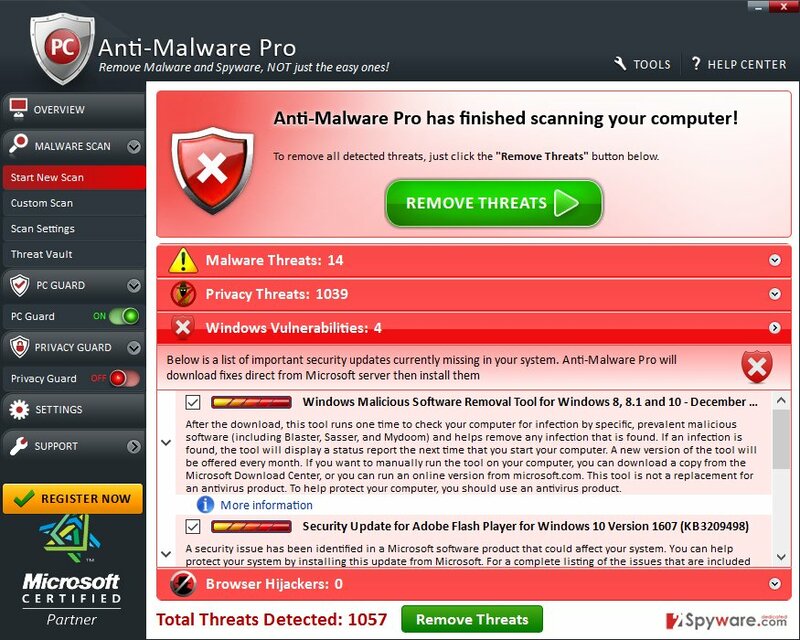 What is more, Anti-Malware Pro offers a great plan for business owners who wish to protect work computers – the publisher of this anti-spyware program suggests unlimited PC’s license keys for only $49.97 every six months. It is likely that some computer users will try to get this software for free and find Anti-Malware Pro crack or Anti-Malware Pro license key online, or use questionable keygens to generate the activation code. Please don’t do it – there are several reasons why you shouldn’t try to obtain the license key of anti-spyware, anti-malware or antivirus programs free of charge. The first and most important reason is your security, and there are a few things we would like to say regarding this matter. You probably already know that software cracks, keygens, and other tools that help to activate software illegally are often bundled with malicious files and programs. Malware authors know that many people are not willing to pay for security programs, and this, in fact, makes them happy. They can easily use keygen or crack as a bait and attach malicious programs to it and easily infect your system with Trojans, viruses, keyloggers, or even ransomware. Another danger related to software piracy is that even if you manage to obtain a malware-free copy of it, you are not going to be able to update it and fill it with new spyware and malware definitions. In other words, the pirated software will be able to identify only viruses that were known at the time it was cracked. Using a pirated security software makes no sense since the most important thing regarding security programs is updating. Finally, software piracy is an illegal thing, and if you get caught, you will be prosecuted. It definitely is. Anti-Malware Pro is a legitimate anti-spyware software, and there is no need to doubt its credibility. Considering the fact that there are loads of computer security products on the market today, deciding between several competing products can be difficult. Besides, some competitor companies might try to underrate competitive products by writing bad reviews, comments, and similar content online. We believe that you should rely on your own opinion, and the best way to test a program is to install it and try it. As we have said, Anti-Malware Pro gives a money-back guarantee in case the program disappoints you. Clearly, there is nothing you can lose. Question. I am looking for an anti-spyware software that could stop me from installing anti-spyware programs (because I don’t know which programs are safe to use and which ones are not). 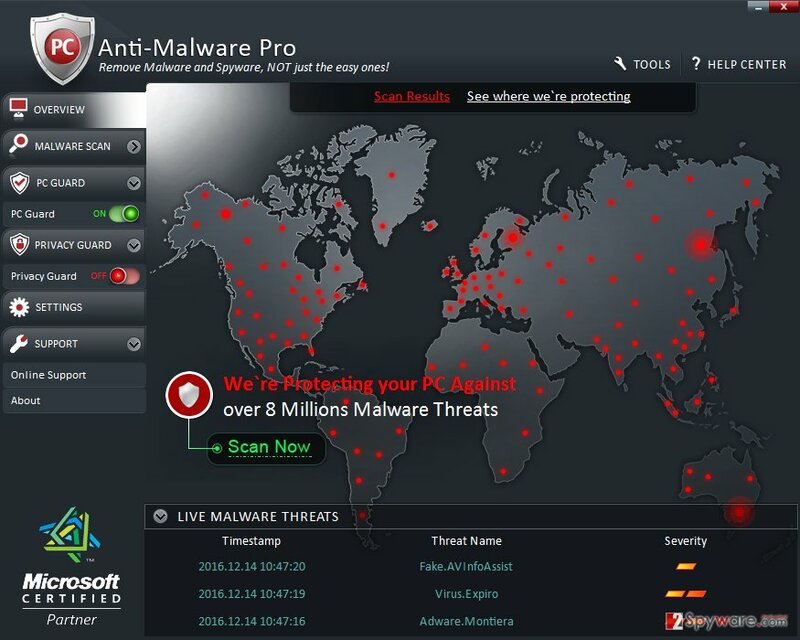 I recently discovered Anti-Malware Pro, but I could not find a lot of information about it online. What do you think about this program? Answer: Anti-Malware Pro is a legitimate product, and with so many competitors in the market, it is hard to stand out. However, the program is definitely a good choice if you’re looking for a real-time protection against spyware parasites. It provides powerful protection not only against low-level spyware threats, but also against malware, removes adware, trojans, worms, and other viruses, and has a thoroughgoing uninstaller that helps to get rid of computer threats quickly. In our opinion, the best decision would be to use this program alongside an antivirus – this way, your computer would be securely protected from all sorts of malware. Question. Hello, I have recently purchased Anti-Malware Pro 2017. My question is, how can I set this program to scan for Windows Vulnerabilities only? Answer: To perform a customized scan with Anti-Malware Pro, just click on Scan Settings and disable each option except Windows Vulnerabilities. You can also customize the scan level sensitivity if you wish. Question. Anti-Malware Pro 2017 didn’t catch a virus that displays annoying pop-ups on my screen. What should I do now? Should I uninstall this anti-spyware and use a different one? Answer: There is no need to uninstall Anti-Malware Pro 2017 only because it didn’t remove a certain program. There are several reasons why this could have happened. First of all, make sure that you scan the computer after checking for the latest Anti-Malware Pro 2017 updates. You should install them to make the program capable of recognizing the latest spyware and malware examples. If the program fails to detect the virus again, take advantage of Anti-Malware Pro Help Desk feature, which allows certified technicians to remotely analyze your computer and provide a custom fix for the problem that you are experiencing. This entry was posted on 2016-12-14 at 04:27 and is filed under Anti-Spyware, Software.